Another favourite from earlier this year (and yes, another yellow one!!) a shopfront project I worked on this Spring for a hip, new, pop-up meatball joint called CURVEBALL opening up in Balham. 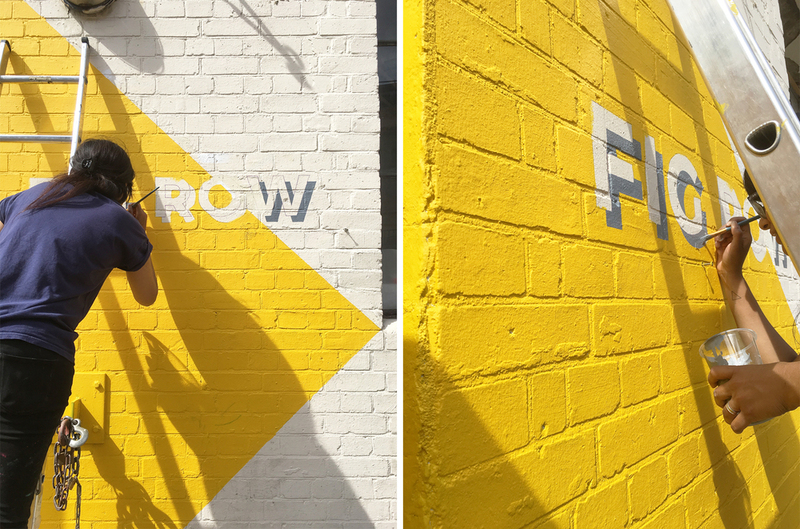 I was commissioned to paint their logo as well as design and paint playful window graphics that would grab people's attention and lure them in, particularly in the the run up to their big launch. The premises is located on a busy pedestrianised street just off Balham high street, surrounded by numerous shops and well known eateries so it was imperative that the new spot "stood out from the crowd", so to speak. So after a series of discussions on the overall aesthetics of the restaurant, it was decided that the first move to achieve a frontage that popped out from all the distractions on that street, and stay in keeping to the brand, was to paint it a fresh, zingy colour a.k.a. 'Yellowcake' by F&B. The logo I then painted was done in a dark charcoal grey/black colour, with a subtle drop shadow, in order to maximise legibility from all points on that busy street. As for the design - I wanted this piece to explore free-hand lettering styles and compositions so that reflected both the playfulness and craftsmanship that you would find behind all the globally-inspired dishes and drinks that would be served at the restaurant. The whole job took 5days: 2days to finalise the design and 3 days to complete on site which includes all the setting up, drawing out and painting. The window graphics that spanned 2m in width, was probably the trickiest to do having had a steep and tight staircase to work from inside and decorators to work around too, but I have to say it made the job all the more satisfying seeing the finished article at the end. Final/official images will be coming soon to the 'Portfolio' section but in the meantime, here's a peek of how it looked a week after it's reveal. Oh and you should totally stalk their Instagram account - but be warned, it will leave you salivating... or worse, licking your screen! Gosh, this post is SO long overdue! I've been meaning to share these behind-the-scenes images of one of my favourite projects of 2017 but as usual, there never seems to be enough time to do it all! Better late than never though, right? So, here's a small glimpse of all the fun, messy and labour-intensive work that went into the final piece I did for DF Mexico back in February - especially if you missed the snippets I shared on IG and twitter back then. This piece was designed and created for the DF Mexico's Shoreditch premises. If you're familiar with the place, their wall by the entrance (with the striking yellow painted graphics) was simply screaming for something eye-catching. And me being me, it obviously had to be type-based and a fun catch phrase of sort, one that would stop punters in their tracks. So, after exploring various avenues, I decided on the phrase 'If you're looking for a sign, this is it'. I love how it simple and literal it is. Not to mention being a fun, tongue-in-cheek nod to my line of work as well as being open to interpretation to all those who would encounter it. The key statement phrase was broken down into individual signs, where each piece explored a different lettering style using bold Mexican-inspired colours, and layered in a collage-like format. 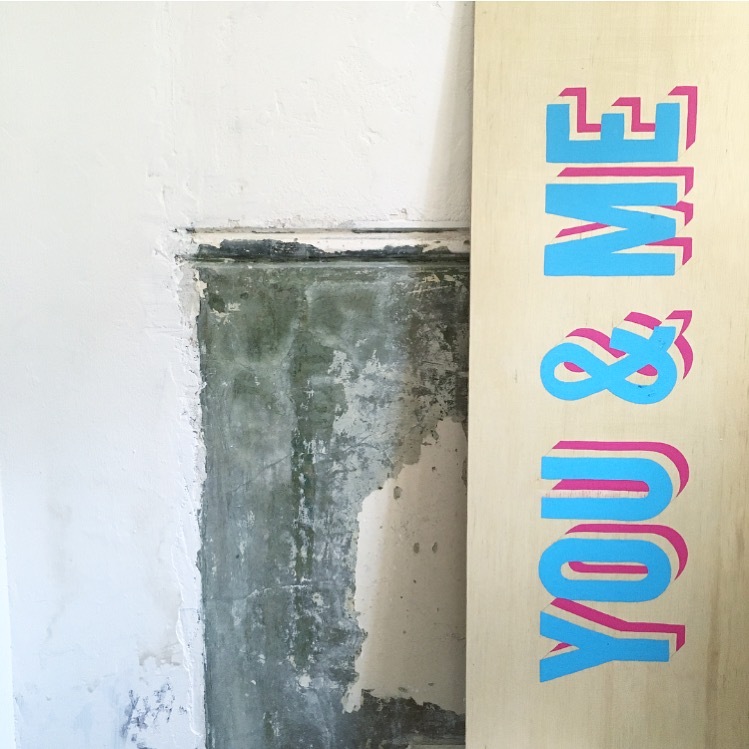 Each piece was painstakingly hand-cut, hand-lettered, hand-painted and assembled on site! If you're ever in Shoreditch by Truman Brewery, do stop by and check it especially over their awesome tacos and frozen margaritas!! We've had many folk tweet and instagram it already, so if you're on social media do share all your amazing pics using the tag #MOLUXDFMEXICO a long with @madebymolu and @dfmexicodiner so we can all have a nosey! Official photos can be found here. Anyway, I have two dates for the workshops which I mention in detail below. Both varying in content so if you fancy a bit of sign-painting fun please do come and join me on either of those days. All the materials you need will be provided on both occasions so all you need to bring with you is oodles of creativity! THURSDAY 8th DECEMBER (4-9M) - I will be running a small drop-in lettering workshop at The Museum Of London Docklands as part of the new Crafty Fox 'Night Markets'. You get the opportunity to paint funky alphabet or numeral tiles (15x15cm) in various typographic styles I've designed which would make awesome keepsake pieces for the home or workplace or even as handmade gifts - all for a mere £5! I will also be selling my typographic wares (signs and prints) alongside the workshop. There will be an array of talented designer makers selling their products too so all the more reason to swing by. I will be there from 4-9pm! You can find more deets on who's showcasing here. SATURDAY 10th DECEMBER (9.30-11AM) - Crafty Fox Markets will be holding a mini market over the weekend at Boxpark Shoreditch, showcasing some of highly talented designer-makers from their 'Shopping with Soul' directory. There will be creative workshops too and I will be running the one on Saturday! 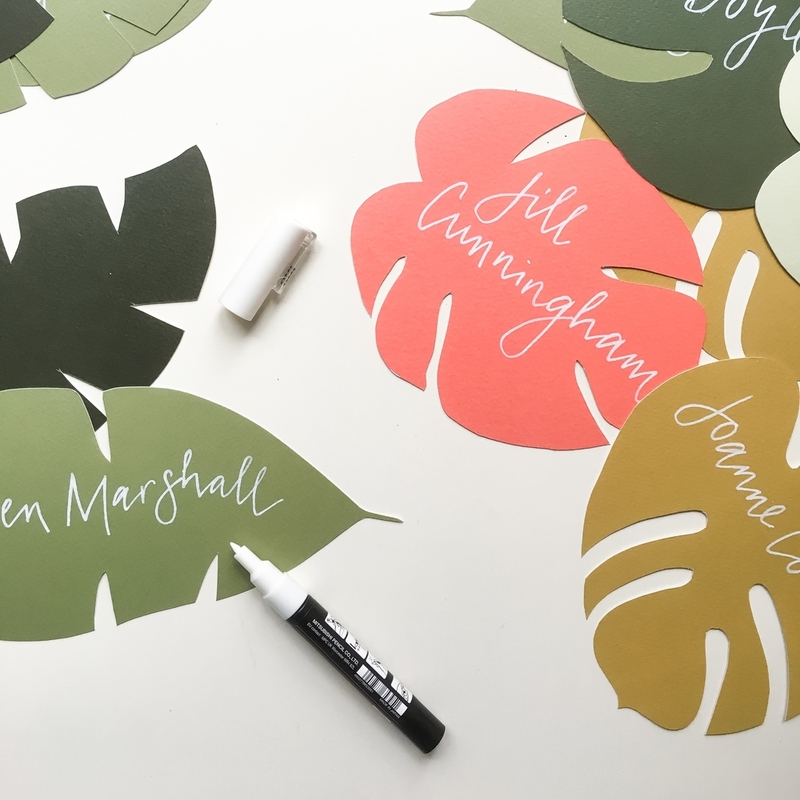 This will be a more detailed workshop, running form 9.30-11am, where you get the chance to paint and create larger/detailed typographic signs to keep. I will guide you through various styles and you can choose from one of many templates I've designed....or if you're confident and creative, you can design you're own! Again, this will be a perfect opportunity to create something truly special and unique, either as a keepsake or a gift! Spaces are limited for this workshop so to book your place, please go here! So if you do like the sound of those workshops, do join me for some typography fun over mulled wine and minced pies! And please do spread the word if you know anyone who may be interested! This little project was such a delight to work on a few weeks ago. The client had transformed a small horse trailer for her catering business, Sweet Nothing so I was appointed to do the lettering across three sides, as the first phase to this project. The lettering comprised of her business logo with some key strap lines and social media content, all in her brand colours. 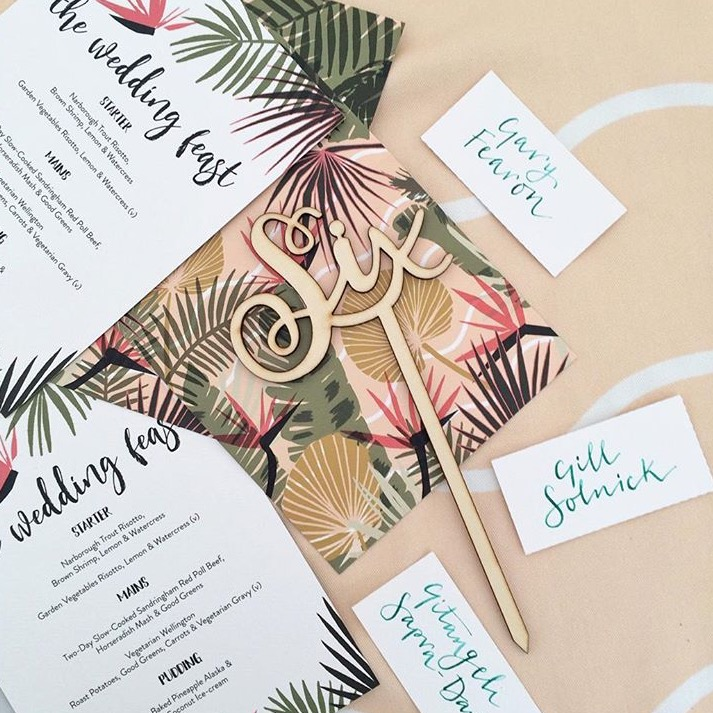 We wanted to keep the design pretty simple so that she had the flexibility to add further elements depending on the type of event and location she would be catering at. While the overall design wasn't anything too extravagant, the application work did consist of three days due to some tricky surface areas of the trailer and the size of some of the smaller lettering; one day setting up the lettering guides and drawing it all out, followed by two solid days of painting. What do you think? I'm pretty pleased with how its all turned out. The colours all work really well and I just love the subtle yet clever use of drop shadow to give it that extra little pop without it being too in your face. I'm hoping to get official photos of the trailer in-situ once it's on the road but I thought I'd share these with you in the interim. Phase two will consist of some larger and removable signage that would be used as props when stationery so i'll keep you posted when we come to that stage. A little round up of what's been taking place behind the scenes in and out of the studio (from freelance work to private commissions) over the last there months. The variation of work from large scale murals to smaller custom-made signs, while challenging in its own ways, is always so refreshing - definitely keeps me on my toes! You can see more of these over on my Instagram too. Last week, I worked on an entrance signage for the studio in Limehouse. 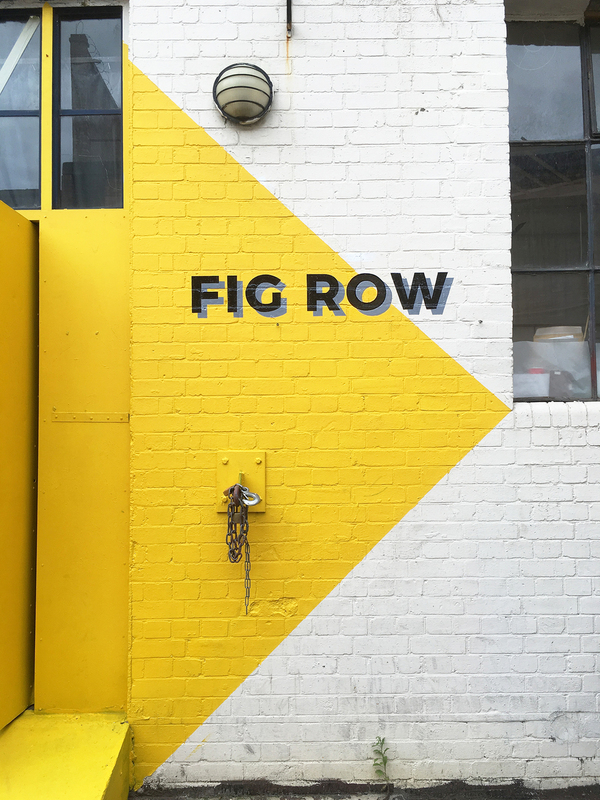 The rather weathered frontage had been aching for a lease of life so I proposed the idea of creating a bold, bright and statement entrance using a yellow, black and grey as the primary colour palette. The design was kept relatively simple with the entranceway as the focal point. 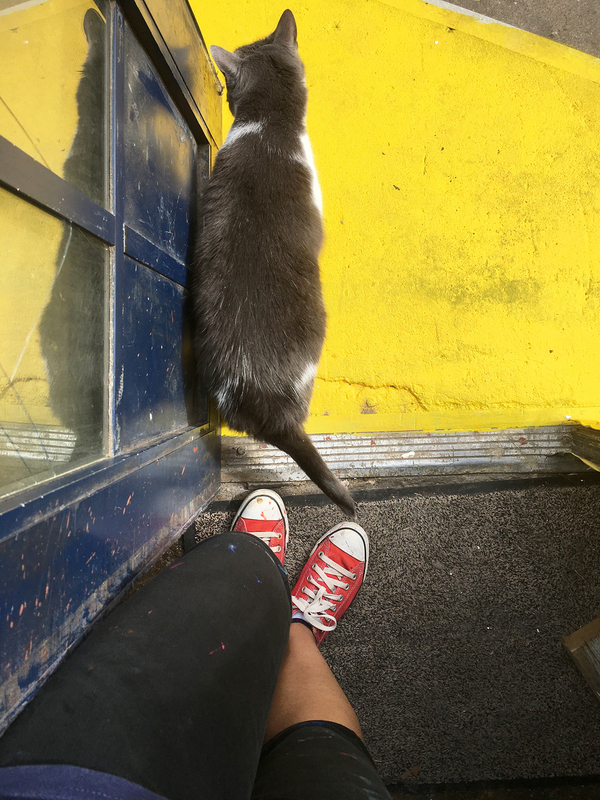 Taking key points around the doorway, I mapped out a bold geometric shape which I then blocked out in bright yellow masonry; from the walls and doors to the concrete floor. I kept the typeface for the studio name clean and minimal, which I hand-painted in black and included a grey drop shadow to give it an even stronger and punchier look. I absolutely loved working on this project for it's scale and overall simplicity which worked out a lot more effectively in the end. The yellow totally makes it! All in all, it took 3.5days for the entire job (from initial design sketches to production) and was lucky enough to have good weather for it too! I will be taking more professional shots to add to my portfolio section, but in the meantime, here are a few behind-the-scenes images of me at work! A little round up of what's been taking place behind the scenes in and out of the studio (from freelance work to private commissions) over the last there months. Oh I do love the range of work I get....especially when it's so hands on! 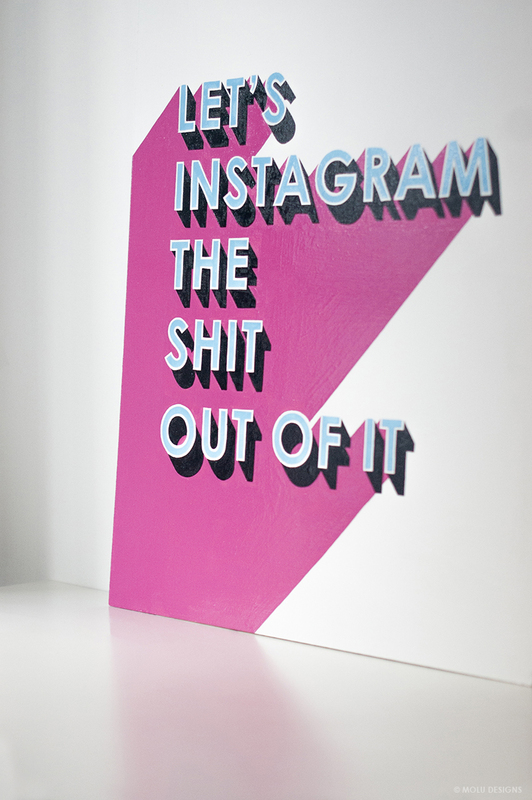 Currently working on a series of custom-made typographic signs which I'm hoping to put on the market this year. Similar to my prints, these signs will be inspired by fun, uplifting quotes and graphics that would suit both the home and workplaces. This first one, was coined by my husband as a response to my Instagramming (and general photographing) obsession....so I couldn't help but design and paint it! Pretty sure, many of you will relate! So yea, let me know what you think - there's more in the pipeline!